Recently a courier brought me a big box - not all that unusual as we live in the country and I don't have easy access to shops, so I buy a lot of things online. This box had my new baby in it! A baby Brother sewing machine! 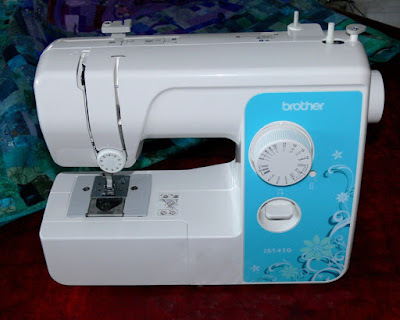 Since my traumas of the last two sewing machine services, (you can read about it here) I have been thinking that I really need to have a spare machine. The frustration of being without one for an extended period is just too painful, so I've been scouring advertisements and internet for the last six months. When I saw this little baby reduced to one third of its original price, I knew that my search was over. I found out that it was an absolutely genuine reduction because I mucked up the date and went to purchase it online a day before the sale started and it was still full price! It was worth waiting the extra day! Of course it is very basic, but sews nicely, weighs a feather, will be good for teaching the young ones in the family to sew when they come to visit ... and is such a pretty blue! Talking of babies, a dear couple gave me some stems of these beautiful lilies. A couple of flowers were starting to open, but there were lots of buds and a couple of baby buds that I was sure would never open as they were so small and tightly closed. 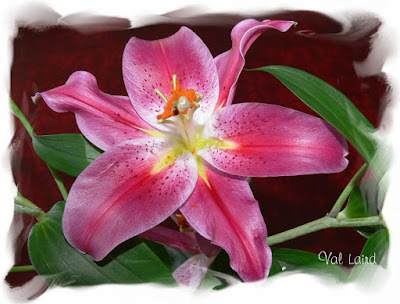 But two weeks later, I am still enjoying the lilies as they open right up the stem. 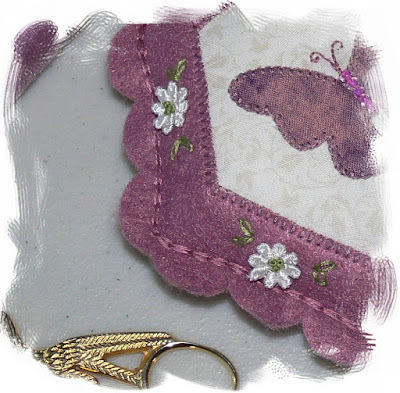 It continues my love affair with felt! Time with family is on the agenda for the next couple of weeks so I will gladly pack the sewing machine away. I just hope there isn't too much mending coming my way! My favourite quote: Asking a quilter to mend is like asking Picasso to paint your garage! That is a rather cute sewing machine. Enjoy playing with it. Love the sneak peek of your new project. Ha ha Val. I hope you don't have any more mending to do. I can tell it is not your favourite job. That is a lovely little sewing machine. I bought a small light one for my granddaughters a couple of years ago. How lovely to have a new baby in the house! LOL! It's always good to have a spare. My machine usually decides to have problems on Sunday afternoons when I have a deadline, and all the shops are closed. Congratulation to this nice little sewing machine! Isn't that cute!!! For Christmas I bought myself a 1948 Singer Featherweight and she sews good and straight. I wanted something when I bring in my more modern Pfaff for service but I really like the Featherweight more than I thought I would. I bought her a new LED lightbulb, a new foot pedal, made her a quilted cover, bought caranuba wax, crocheted an Irish Rose for the spool of thread to sit on so it doesn't vibrate so bad. She's been around longer than me and still runs good. I bought her from a friend and her metal gears are in great condition and the motor bushings are great too. I bought a book and dvd on how to maintain her properly. I think she'll be humming along long after I'm gone. Amen on the mending quote! =) Your baby Brother is adorable. It's a good brand, too. If there's nothing else around, though, I'll even sew on a bad machine. LOL Thanks for the sneak peek at your new project. I'm guessing you might be too busy to post a lot for a couple of weeks, too!